Rand Paul has suspended his bid for the US presidency in the face of dismal Iowa results and fundraising. In the face of the aggressive and uncompromising image of his rivals Donald Trump and Ted Cruz, Rand's watered-down brand of libertarianism doesn't seem to have caught on. This is in stark contrast to Rand's father Ron Paul who made few (if any) compromises on principle during his presidential runs -- and inspired massive support and a general awakening of libertarianism in America. A sad day for "work-within-the-system" libertarians and perhaps a lesson to future liberty candidates. 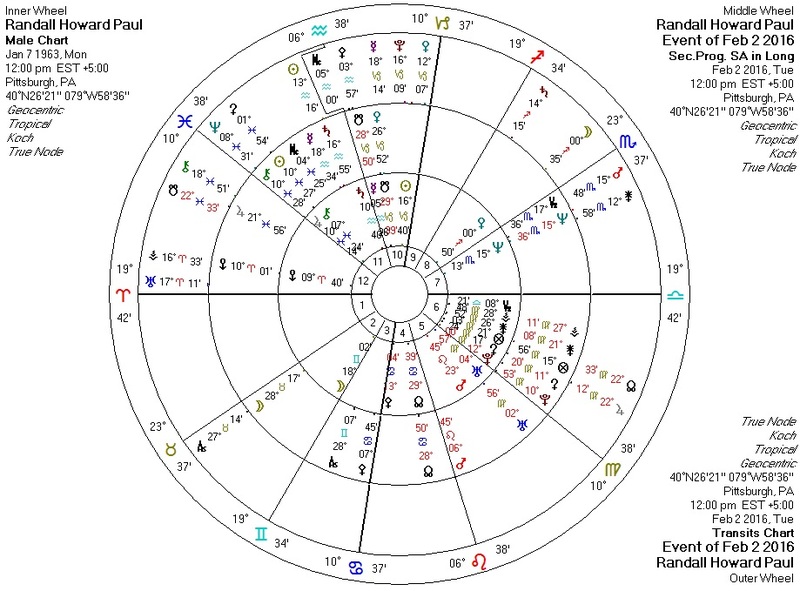 Transiting Pluto conjunct Paul Sun, triggered by transiting Mercury: news triggers a type of death. Progressed Sun and Chiron conjunct Paul Jupiter in Pisces, triggered by transiting Neptune: hopes and dreams wounded and made to disappear. Transiting Saturn square Paul Pluto: power, restrained. This makes Donald Trump the closest thing we have to an anti-war candidate. I have some serious problems with him (not the least of which is his record of imminent domain abuse) but he appears to be the least evil of the pack now that Rand is out. I'm glad, at least, that I'm not writing about yet another terror attack (see last month's posts).